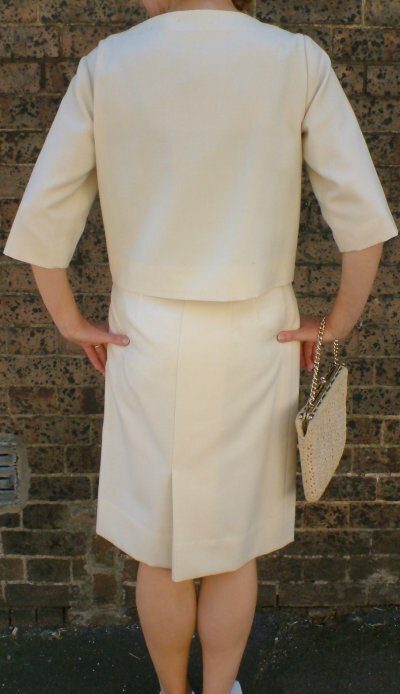 Vintage1950s cream skirt suit with big button jacket - very Jackie Kennedy. For me, Jackie K was the style icon of the late 50s and early 60s - she epitomised a kind of elegance and glamour that is hard to define but easy to recognise - and this suit is a copy of one she wore. The boxy jacket has elbow length sleeves, and fastens on the left, rather than at the centre. There are four, self-covered buttons, plus a poppa at the top to keep the line neat. The knee-length, pencil skirt fastens with a metal zip, hook and eye, plus a poppa again for extra security. Professionally made, both pieces are fully lined and the skirt has a taped hem. The suit may only have been worn once: it's in truly excellent condition, and even very clean considering its age (though we always recommend you get your new garment dry cleaned). 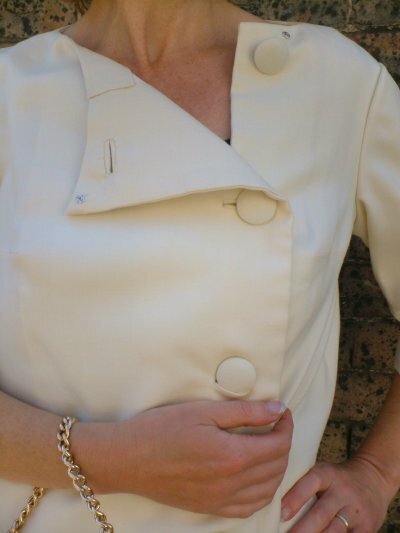 Just the thing for a summer wedding, it's about a UK 8 or small 10: approximate measurements are, jacket: length of back 19ins/48 cms, length of sleeve (underarm seam) 9½ ins/24 cms, bust 38 ins/96.5 cms; skirt: waist 25½ ins/65 cms, hips 37 ins/94 cms, length including waist band (1½ ins) 25¾ ins/65.5 cms. PLease be aware that, as always, these are the measurements of the garments, not necessarily the size they will fit!